As to be expected, it is an overtly Burton-esque piece of work with its desaturated palette allowing the red of the blood to pop even more than usual and the focus being on psychologically disturbed character. 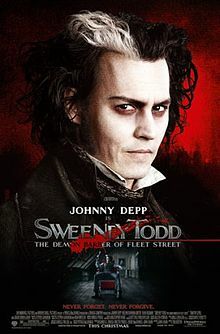 Frequent collaborators Johnny Depp and Helena Bonham-Carter take on the lead roles of Sweeney Todd and Mrs Lovett and though neither of their voices are particularly strong, especially when up against Sondheim’s challenging score, Burton manages to make that much less of an issue than one might have thought. There’s a brooding intensity to the whole affair, a sense of drained weariness which subsequently finds strength in the vocal frailties. Alan Rickman makes a perfect Judge Turpin, his sonorous malevolence a highlight of the film especially in the ‘Pretty Women’ duet; Timothy Spall’s Turpin makes a strong impact too as does Sacha Baron Cohen’s would-be manipulator Signor Pirelli. Making a two hour film from a three hour show means cuts had to be made alongside the considerations of working in a different medium and now having both reference points I can see how good a job Burton did (IMHO). It has been a case of careful trimming rather than wholesale butchery in that whilst some songs have gone and others slimmed down, the musical architecture of the show remains in place and still crystal clear. The chorus has gone but is barely missed at all and the anaemic romance between Jamie Campbell Bower’s Anthony (who was there at the opening night in Chichester looking much blonder and hunkier!) and Jayne Wisener’s Johanna has been cut down which is no great loss. Not everything works quite so well though. Burton’s excursions outside of the confines of the pieshop and salon fall flat, the freedom of cinema not actually necessary here, and because the overall tone is one of such gloom, much of the black humour has been lost: ‘A Little Priest’ in particular is most underpowered. This is where the comparison with the Chichester production kicks in hardest I think as Imelda Staunton’s performance was frequently hilarious and the ensuing journey into darkness all the more emotionally effective. That’s not to say this interpretation isn’t valid, for it really is and there’s probably a more affecting relationship between Mrs Lovett and Toby in the film, it is just a different piece of art. In some ways, it was probably best that I saw the film and the show this way round as there’s no denying that Sweeney Todd comes across better on stage, especially in a production such as CFT’s. But seeing the film without preconceptions of how it ‘should’ be done allowed to judge it on its own merits and I have to say I found it an affecting film then and still do now. 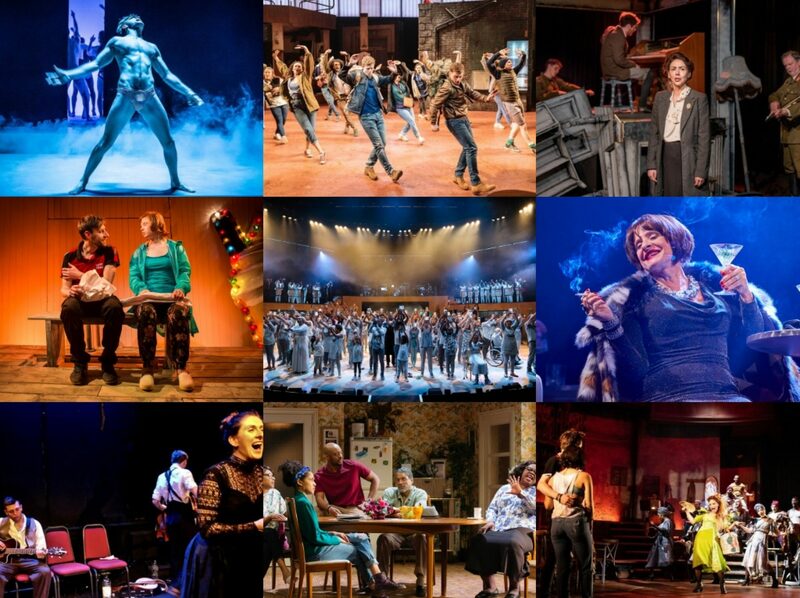 It probably needs to be judged as a film rather than a piece of musical theatre (aside from Laura Michelle Kelly, the only recognisable MT faces are in brief cameos as customers in the pie-shop) for that is how Burton has approached it but if you’re willing to go with it, then it might just work for you.